Wilson disease (WD) is an autosomal recessive disorder of copper metabolism. It is caused by defects of ATP7B encoding a copper transporting P-type ATPase. The gene is located on chromosome 13q14.3. Mutation of this gene disrupts copper homeostasis, resulting in the accumulation of copper in the liver, brain, kidneys and corneas and copper toxication at these sites. Until today, more than 300 disease-specific mutations have been identified. To detect mutations of the entire ATP7B gene in Vietnamese patients with WD, sequencing analysis was applied. We detected three mutations in ATP7B genes that have not previously been reported. Two are missense mutations and one is a non-sense mutation. Furthermore, segregation analysis showed no mutation transmission patterns within each family of WD patients. Novel mutations in ATP7B in Vietnamese WD patients merit inclusion into the genetic epidemiology and the population genetic public database. Copper is an essential component of many enzymes such as: lysyl oxidase, superoxide dismutase, dopamine-β-hydroxylase and cytochrome C oxidase. These copper-dependent enzymes are needed for diverse process of oxidase metabolism including respiration, free-radical detoxification, neurotransmitter synthesis, maturation of connective tissue and iron uptake (1-2). However, copper is only required in trace amounts; accumulation of copper can damage plasma membranes, peroxisomes, mitochondria, microtubules, enzymes and even DNA (3). The effect of copper imbalance can be described best in two human genetic disorders: Wilson’s Disease (WD) and Menkes’s Disease. WD is an inherited autosomal recessive disease first described in 1912 by Samuel Alexander Kinnier Wilson. Prevalence of the disease is approximately 1 in 30,000. In 1993, Bull et al. identified the genetic defect of WD within the copper-transporting P type ATP7B gene located in chromosome 13 (4). According to Wilson’s Disease Mutation Database (http:// www.wilsondisease.med.ualberta.ca/database.asp), more than 300 disease-causing mutations have been detected and the number is still growing because mutations in the ATP7B gene vary in different populations. A recent study identified a mutation hotspot in exon 2, 8, and 10 within a sample of Northern Vietnamese population (the data have been submitted for publication). In this study we have identified three novel mutations in ATP7B with WD by using DNA sequencing. All of them are heterogeneity mutation. Three Vietnamese patients from unrelated families were selected. All patients had been diagnosed with WD and treated at the National Hospital of Pediatrics in Hanoi, Vietnam. WD diagnosis was based on multiple clinical symptoms, including liver failure and/or neurological issues and/or the presence of Kayser- Fleischer ring in eyes, and biochemical markers, such as low serum ceruloplasmin (CP <20 mg/dL) and high level of urinary copper (Cu >100 mg/24h) (5). Genomic DNA was extracted from peripheral blood collected in EDTA tube using Wizard Genomic DNA Purification Kit (Promega, Madison, Wisconsin, USA) following manufacturer’s protocols. Entire exons of ATP7B gene were successfully amplified by using 24 primer pairs (four primer pairs for exon 2, one primer pair each for others) (IDT, Coralville, Iowa, USA). PCR was performed using GoTaq Green Master Mix (Promega, Madison, Wisconsin, USA) with 100 ng of genomic DNA in a mix containing 1U of Taq Polymerase, 10 pmol of each primer and distilled water. The thermocycle program consisted of an initial denaturation at 95 ºC for 5 min, followed by 35 cycles at 95 ºC for 30 s, 55 ºC for 45 s, and 72 ºC for 30 s, with a final extension at 72 ºC for 3 min. The size and quantity of PCR products were verified by electrophoresis in 1.5 % agarose gel. PCR products were directly sequenced using BigDye Terminal Kit (Amersham, UK) and Avant 3100 Genetic Analyzer automated sequencer (Applied Biosystems Inc., Foster City, California, USA), and data was analyzed using CLC Genomics Workbench (CLC Bio, Qiagen, Venlo, Limburg, Germany). All products were sequenced in both forward and reverse strands. All three patients demonstrated similar symptoms and laboratory analyses revealed low ceruloplasmin, low serum copper and increased urinary copper excretion (Table 1). Genomic DNA was isolated from the peripheral blood leukocytes of the subjects. DNA sequencing analysis was applied to identify mutations and polymorphisms of all 21 exons of ATP7B gene in 3 Vietnamese patients with WD. 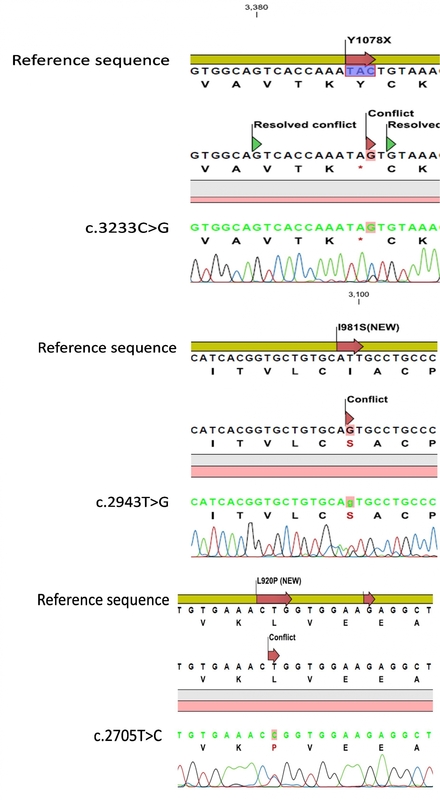 One nonsense mutation and two missense mutations in Table 2 were found to be novel: c.3233C>G; c.2943T>G; c.2705T>C (Figure 1). This procedure used Polyphen, an automatic tool predicting possible impact of amino acids substitution on the structure and function of human protein in analyzing the novel missenses mutation. The mutations were correctly identified as novel mutations in the WND database (http:// www.wilsondisease.med.ualberta.ca/database.asp). Notes: Genbank Accession NM_000053. The first nucleotide of ATG translation codon is considered nt + 1. Serum CP was measured by Immnoturbidmetric test. Normal values for serum CP is 20-60 mg/dL (5). Normal values for urine Cu is 10-40 μg/day (5). Notes: Genbank Accession NM_000053. The first nucleotide of ATG translation codon is considered nt +1. Clinical manifestation of three patients showed involvements of three affected organs including liver, brain, and cornea with low level of serum ceruloplasmin (Table 1). Segregation analysis within 3 families (including parents and one brother) was performed for 3 patients whose mutations in the ATP7B gene had been detected, but no mutations were identified. Wilson disease is an infrequent disorder worldwide in almost all populations. Frequencies of 1:30,000 to 1:40,000 are usually quoted (6), except for Crete and Sardinia with 6:100 and 1:7,000 live births respectively (7-8). At present, diagnosis of WD is extremely difficult especially for clinically asymptomatic individuals or those with atypical clinical manifestations. Moreover, different WD patients have different clinical features (9). Particularly, WD is representative of a low number of diseases that difficult to be treated; however, early diagnosis increases the probability of recovery (9). Until now, more than 300 mutations have been reported in many different populations but a few of them show relative high frequencies in some geographic areas. The most frequent mutation in Europe is H1069Q with values over 65 % (10), in Sardinia, c.-441_- 427del accounts for 61.5 % of mutated chromosomes (8), mutation M645R is present in 55 % of patients in Spain (11), and R778L is very frequent in Hong Kong patients (12). Deletion c.3402delC at exon 15 has been reported worldwide at low frequency (usually below 2 %) in several populations; contrarily a high frequency (34.8 %) occurs among Brazilian index cases (13) and the most frequent mutation in Vietnam is S105X with 21.05 % (data submitted for publication). In recent years, assisted by the development of molecular analysis, the diagnostic rate has been improved. However, clinical laboratory molecular diagnosis is expensive because there are many types of ATP7B gene mutations. Novel mutations appearing in some populations or races are inevitable; therefore, wide publication of these novel mutations and screening to identify some mutation hotspots are essential. In our study, three novel mutations (c.3233C>G; c.2943T>G; c.2862A>G) in the ATP7B gene were detected in 3 WD patients by sequencing all exons. Our data enrich the database of Vietnamese WD as well as the WND database. 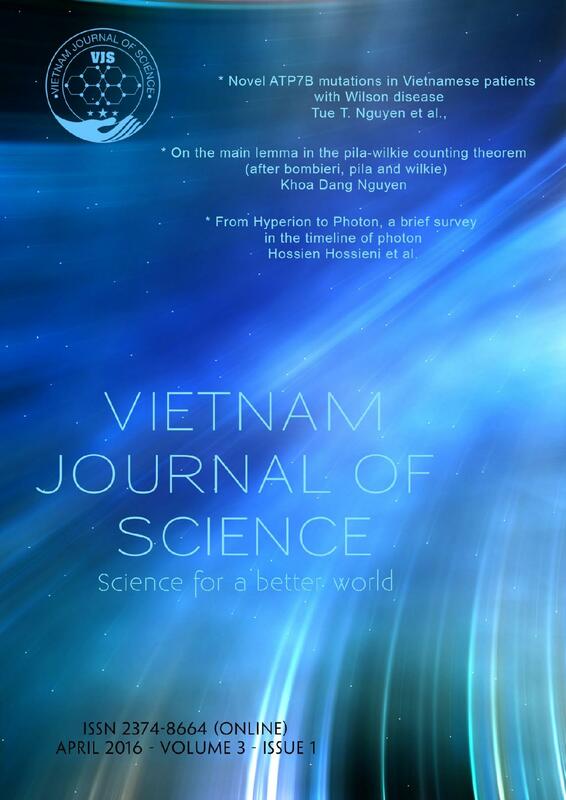 This research is funded by Vietnam National Foundation for Science and Technology Development (NAFOSTED) under grant number 106.16-2011.01. Dr. Tue T. Nguyen received PhD from Kyoto Institute of Technology at Kyoto, Japan in 2011; his researches focus on human genetic disease using the Drosophila melanogaster model. Tuan L.A. Pham, Tu C. Ho, Dat Q. Tran are researchers at the Center for Gene-Protein Research at Hanoi Medical University. Dr. Thinh H. Tran got PhD from Kyoto University in 2011 and his study is immunology or related fields. Prof. Van T. Ta is a vice rector of Hanoi Medical University and head of the Center for Gene-Protein Research. Assoc. Prof. Khanh V. Tran is an expert on the DMD; she has many experiences in human genetic diseases. 1. Yuan, D. S., Stearman, R., Dancis, A. et al (1995). The Menkes/Wilson disease gene homologue in yeast provides copper to a ceruloplasmin-like oxidase required for iron uptake. Proc Natl Acad Sci U S A, 92 (7): 2632-2636. 2. Linder, M. C. and Hazegh-Azam, M. (1996). Copper biochemistry and molecular biology. Am J Clin Nutr, 63 (5):797S-811S. 3. Duc, H. H., Hefter, H., Stremmel, W. et al (1998). His1069Gln and six novel Wilson disease mutations: analysis of relevance for early diagnosis and phenotype. Eur J Hum Genet, 6 (6): 616-623 (View Article). 4. Bull PC, T. G., Rommens JM, Forbes JR, Cox DW (1993). The Wilson disease gene is a putative copper transporting P-type ATPase similar to the Menkes gene. Nat Genet, 5: 327–337. 5. Roberts, E. A., Schilsky, M. L. and American Association for Study of Liver, D. (2008). Diagnosis and treatment of Wilson disease: an update. Hepatology, 47 (6): 2089-2111 (View Article). 6. Pfeiffer, R. F. (2007). Wilson’s disease. Semin Neurol, 27(2):123-32. 7. Dedoussis, G. V., Genschel, J., Sialvera, T. E. et al (2005). Wilson disease: high prevalence in a mountainous area of Crete. Ann Hum Genet, 69 (Pt 3): 268-274 (View Article). 8. Loudianos, G., Dessi, V., Lovicu, M. et al (1999). Molecular characterization of wilson disease in the Sardinian population--evidence of a founder effect. Hum Mutat, 14 (4): 294-303 (View Article). 9. Liu, Y., Zhou, H., Guo, H. et al (2015). Genetic and Clinical Analysis in a Cohort of Patients with Wilson's Disease in Southwestern China. Arch Med Res, 46(2):164-9 (View Article). 10. Vrabelova, S., Letocha, O., Borsky, M. et al (2005). Mutation analysis of the ATP7B gene and genotype/phenotype correlation in 227 patients with Wilson disease. Mol Genet Metab, 86 (1-2): 277-285 (View Article). 11. Margarit, E., Bach, V., Gomez, D. et al (2005). Mutation analysis of Wilson disease in the Spanish population -- identification of a prevalent substitution and eight novel mutations in the ATP7B gene. Clin Genet, 68 (1): 61-68 (View Article). 12. Mak, C. M., Lam, C. W., Tam, S. et al (2008). Mutational analysis of 65 Wilson disease patients in Hong Kong Chinese: identification of 17 novel mutations and its genetic heterogeneity. J Hum Genet, 53 (1): 55-63 (View Article). 13. Deguti, M. M., Genschel, J., Cancado, E. L. et al (2004). Wilson disease: novel mutations in the ATP7B gene and clinical correlation in Brazilian patients. Hum Mutat, 23 (4): 398 (View Article). Discussion and Closure of "Novel ATP7B mutations in Vietnamese patients with Wilson disease" by Tue T. Nguyen et al.